This month we will be intentionally praying for Buddhists all around the world! Pray with us that Jesus would be revealed to them through Christian missionaries coming to bring the message of the Gospel! 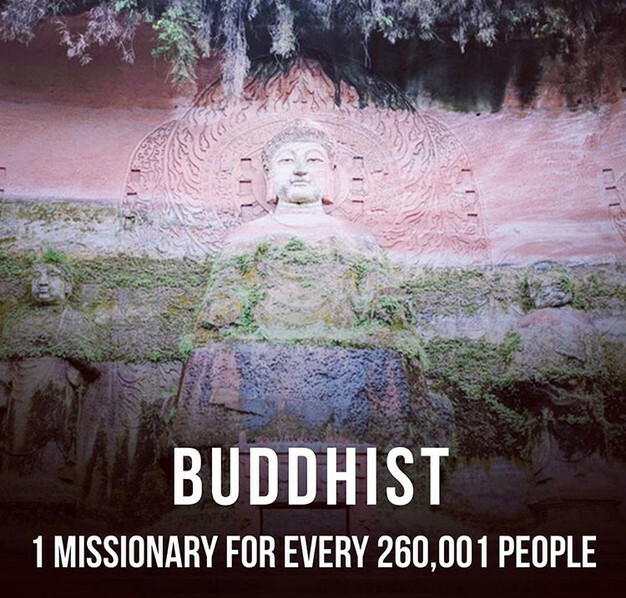 To help paint the picture of the great need of Christian missionaries among Buddhists in the world, there is 1 missionary for every 260,001 Buddhists in the world, and 86% of Buddhists have never spoken with a Christian. It is our great responsibility and privilege to partner with the heart of God that this gap may be closed through our church and through our lives! -Pray for spiritual oppression and fear to be replaced by the presence, peace, and freedom of Christ. -Pray for more Gospel witnesses and personal revelations of Jesus Christ. -Pray for courage to follow Jesus when accused of betraying family and culture. -For more understanding about Buddhism visit http://www.prayercast.com/islam.html or download the Joshua Project app for daily world prayer alerts!